BitSummit is Japans biggest indie game festival and based at Miyako Messe in Kyoto. It is a place where developers, publishers, journalists and people interested in games play together and exchange ideas. Because of our interest in the Japanese indie developer scene and our game SHIRO’s lacquerware design, we were super happy when we received an invitation to exhibit. Our feet were burning to travel to Kyoto again anyway: SHIRO had been started at the end of our exchange semester at Kyoto SEIKA University last year and we lacked more research to finish the game and make its content as interesting as its puzzles. With this article, we want to reflect on our impressions, share some insights into the Japanese indie world and discuss how our experiences impact the further development of our game. After receiving BitSummits YES, there was a lot to do (that had to be done back in Germany) apart from development itself: We rented equipment, designed business cards, postcards and flyers for BitSummit’s visitors to take home, applied for the SHOSTA scholarship of Kassel University for financial support, planned our trip through Japan and revived contacts to Kyoto SEIKA, friends and fellow developers. Texts and images for BitSummits press work and website had to be created. Instead of just doing what we do, which is to study and make games and artworks, it became about communicating our ideas in simple words/images and about finding structures to process the different aspects of our preparations in little time. Therefore we could do the fun part in Kyoto: We coded the prototype-version of SHIRO’s orange world, improved the touch input, recorded sounds and embedded them into the game. BitSummit was open to the public on July 9th and 10th. On Friday the 8th we set up our table and met some of the other developers, organizers and helpers. We already knew the place, Miyako Messe, from the year before, but it was something entirely different to have a glimpse at all the work both organizers and game makers put into the event — from technical setups to last bugfixes everyone was quite busy. Because we had to prepare everything in advance in Kassel anyway, we only had to set up two iOS tablets and the tons of flyers we brought. In the evening we went to BitSummits first networking party, which was located near Shijo Karasuma within a bar named Den-en. It was especially nice to meet developers and friends from last year again. They were a great help by pushing us into the whole networking process, which can be a bit frightening at first. But, after all, most of the attendees were in Kyoto as visitors and did not know the fellow developers either, which made talking to yet unknown people easier. Apart from game developers, professionals in the fields of marketing, technology (especially VR) and translation were present. We were told that to ‚get‘ business cards from certain people would be a great deal, but the idea of talking to people because of their status seemed weird to us, while on the other hand the event seemed to have been organized due to this idea. Yet, we really enjoyed the cheerful talks and the potpourri of people with all sorts of backgrounds, experience levels and interests. Saturday and Sunday the festival was open from 10am to 5pm. The big hall was filled with visitors to capacity, sometimes with lines of people waiting outside to get in,but the general vibe was sublime. Our two tablets were in use by players almost all the time, so we were highly busy with talking about our game SHIRO in basic Japanese. We did not encounter anyone not interested in the game, which was great. On the contrary, Japanese visitors were very friendly and versatile players, pointing out what they liked about SHIRO and sometimes finding better solutions to our puzzles than we ever found by playing them ourselves before. Some visitors played through the whole prototype, which took about 25 minutes, maybe because SHIRO offered a quiet and relaxing experience within BitSummits tumult. Apart from all the excitement and good feedback, the players questions and communication problems highlighted what had to be done or reworked by us to make our game more comprehensive and easier to play. Above and beyond, the feedback by other developers was extremely helpful, as they could not only sense if something did not work properly, but also had some ideas in mind how to fix these issues. Because the July-version of SHIRO was a prototype and therefore meant to be tested and verified / falsified, it was the right time to receive such feedback and two days of playtests and talks were an awesome way to find out everything about our game and helped us improve SHIRO since then. Unfortunately, we could not play many of the other developer’s games, since leaving our table was only possible for one of us at a time and it was way easier if both of us were present, so we focused on the games of the developers we had met during the evenings. On Saturday, BitSummit ran the ‚developer mixer‘, an evening with drinks, food and games for everyone to meet, that offered the possibility to dive deeper into previous discussions about making games, but also about everything related to games, say, at which platforms to release a game, how to announce and publish, how to make a living in the long run. These were questions extraordinary important to us, because we are currently collecting advice and ideas on how to continue to develop games after finishing our studies next summer. Later that evening, BitSummits river party took place at Kamogawa and was visited by local game developers alike. We talked to independent gamedevs, but also employees of bigger studios. Kamogawa has always been one of our most loved places to hang out and especially in the evenings, when the heat of the day has vanished, it’s super nice to watch the water quietly stream down the city. After BitSummit closed its doors for 2016, those who did not have to catch an early flight met at an Izakaya at Gion. Lessons learned during the festival, contact information and last kind words were exchanged, then BitSummit was finally over. To research, we revisited the old imperial city Kyoto, then headed off to Nagasaki, where we hoped to find traces of State Shinto and Japan during World War II, then took the Shinkansen to Nagoya, from where we went to Ise, Yokohama and Osaka. On the third day of our time in Kyoto we overheard a women in a café talking about the purpose of research, which, according to her, should not be to read about something you already assume to be true, but to embrace the unknown. This of course made us feel better about our poor planning skills, and turned out to be true, as we found information and got ideas not always where we expected. 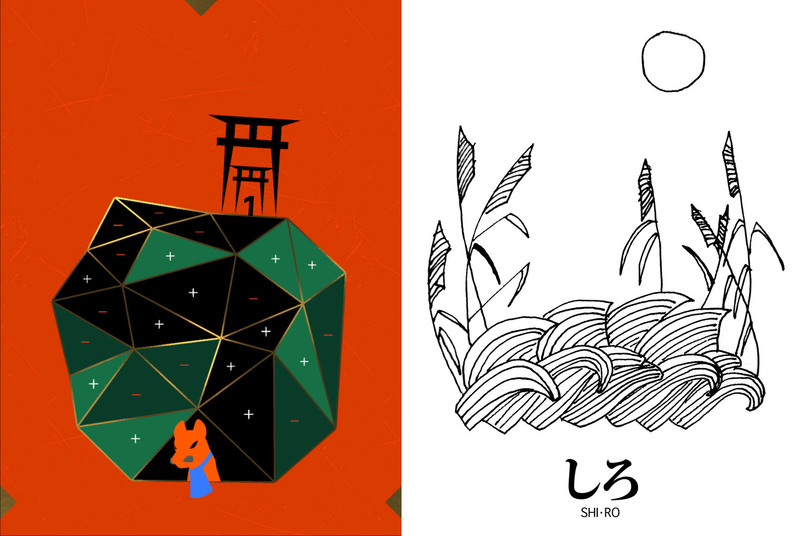 So far, all three prototyped worlds of SHIRO (black, green, orange) tell stories or facts around Japanese mythologies. Shintoism, or the believe in the kami-sama (the myriad gods who are part of and present in nature), does not have many written sources or manifests / rules and asking Japanese people about it led to answers like: 'They (the kami-sama) are just in nature, maybe like spirits.' So the only way to find out more, or, on a level apart from ‘learning content’, to somehow feel or experience what the believe in the kami-sama is about, was to visit some of the more and less important Shinto shrines and the mountains and forests around them. 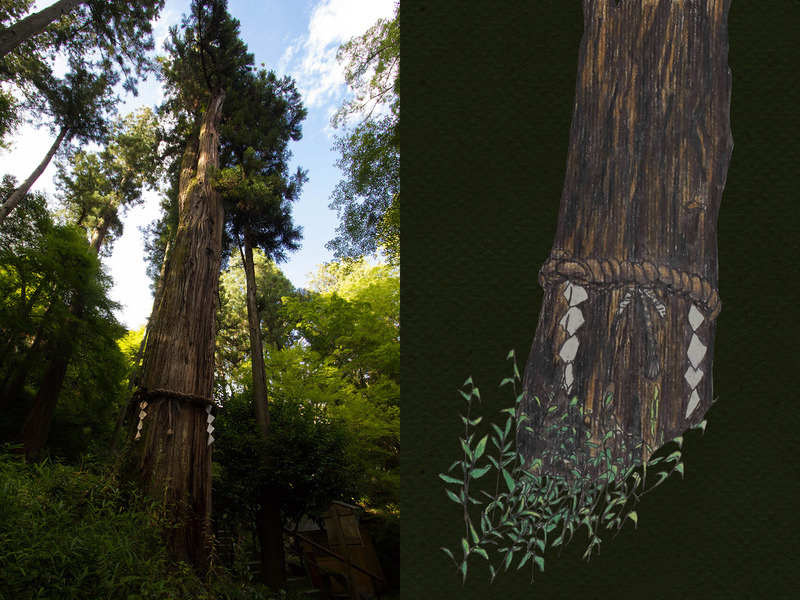 Yashiro-tree at Ishiyama-dera will be part of SHIROs green worlds narrative. We learned that places for kami-sama to dwell in can be natural objects such as stones and trees or human-made like the yashiro. Out of these yashiro the first shrines emerged. Both relevant for SHIRO’s black (making of the world) and green (kami-sama) levels was our visit of Ise Shrine, which is dedicated to Amaterasu, the goddess of light and sun and predecessor of the Japanese imperial house. According to many Japanese, Ise Shrine is the most important shrine in Japan. Within the visitor center pictures of presidents cover the walls, all in dark suits, standing in line respectfully, between them our president Mrs Merkel in a colorful, pastel jacket. During our visit, a man in a suit and two women in dresses were allowed to enter the shrines (so they must have been part of the imperial family or their representatives), while everyone outside was watching them perform their rituals (clapping of hands, bowing). They were accompanied by the shrines priests, young men covered in white fabric. Very interesting to us was that Ise Shrine is being rebuilt entirely every 20 years, but is still called the oldest of its kind. Over all these centuries never has a person seen more than four or five rebuilds of Ise Shrine in their lifetime and only in the youngest past has it been possible to conserve the shrines appearance on photographs - technically, not to speak of the camera ban near the buildings. It is said that visiting Yoshida Shrine in eastern Kyoto confers the same blessings as visiting all the other shrines throughout Japan. This itself seems odd, since one could argue that it weakens the importance of for example Ise Shrine. 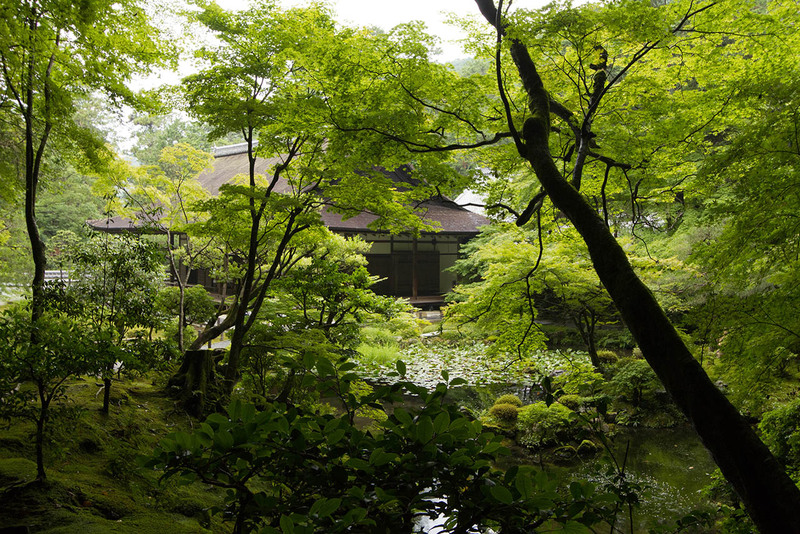 It is located on Mount Yoshida in a beautiful forest, was built in 859 and is one of those places which brought the idea of kami-sama emerging in nature closer to us. 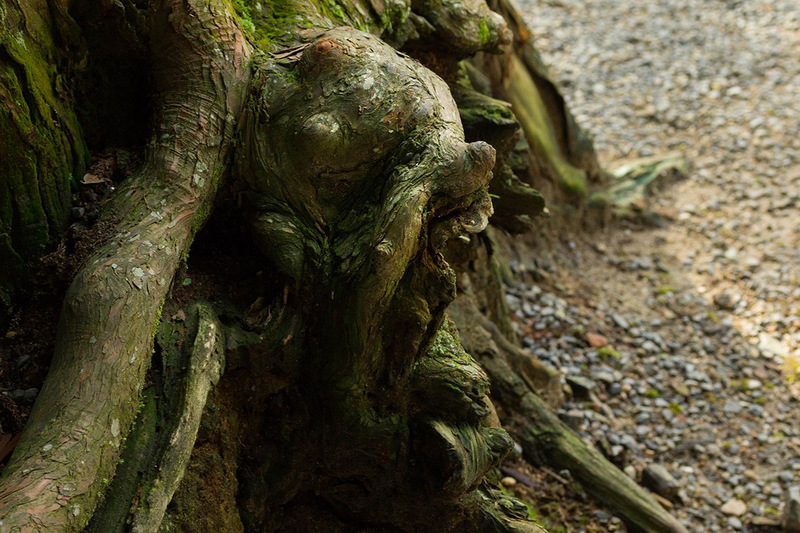 Very few visitors were around and in the soft light of the late afternoon, the old tree’s roots resembled faces. We wondered how Yoshida, who was kind of a reformer of Shintoism, enshrined all the kami-sama of Japan. We came up with a story that will be part of SHIRO’s green world. Jasper sees a lying figure, while I see the face of an old man in these roots. Fushimi Inari Shrine in southern Kyoto enshrines Inari, the god(dess) of rice, fertility and prosperity. Statues of foxes, who are Inari’s messengers, and torii-gates cover the path up Mount Inari. 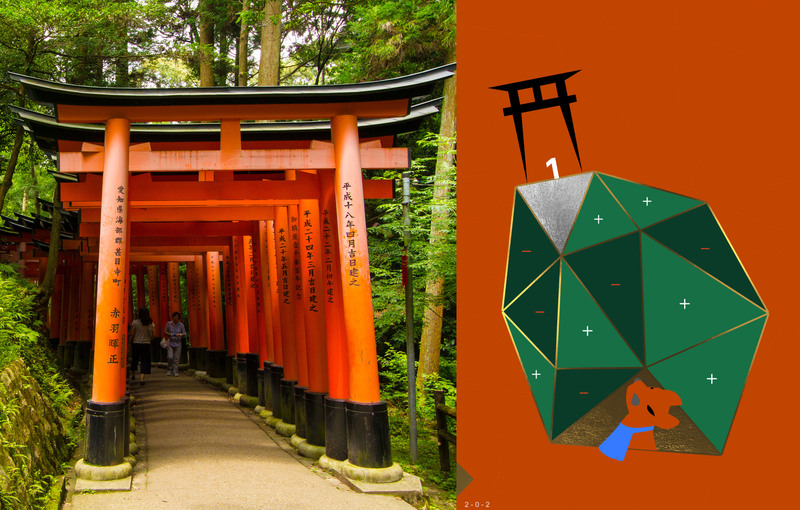 We made sketches and took photographs on our way up the mountain, as we want to tell the story of Inari in the orange world of SHIRO, in which players guide a fox up to the next torii-gate by solving simple mathematical puzzles. 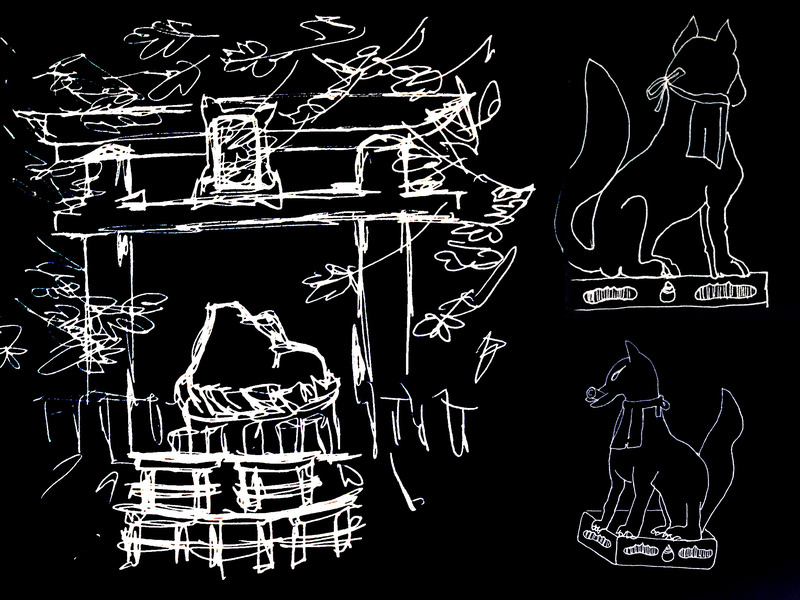 We tried to see what the fox would see, where it would rest, what it would think, what it would tell Inari. To visit Yutoku Inari Shrine takes one and a half hours from Nagasaki by train. 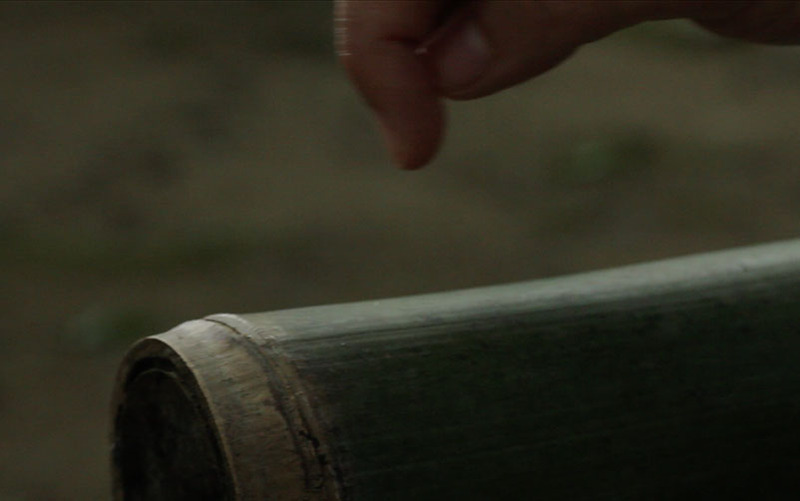 The main architecture of the shrine is fully coated in lacquer, which makes it an interesting reference for SHIRO, as the gamedesign imitates the look of lacquerware. 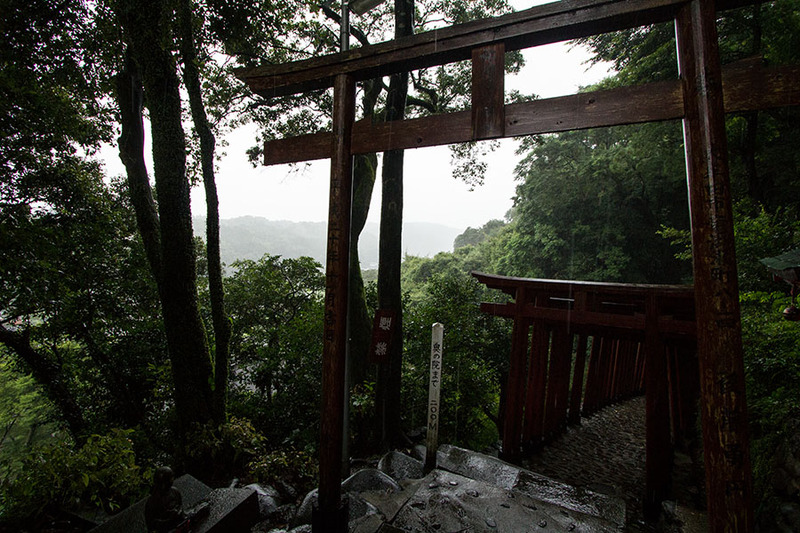 The day we visited the Shrine it rained a lot, and because we could not climb the steep stones underneath the torii-gates while holding our umbrella, we were dripping when we stood on top of the mountain, overseeing the rural area: some houses, but mostly fields and forests, all green and grey, emphasizing the strong red of the torii-gates. We could only partly transfer this color palette into the photos we took, but the view is still so vivid in our minds that it inspired the new colors of SHIROs orange world. Some other shrines and temples we visited were: Kiyomizu-dera, Jishu Shrine, Nanzen-ji and Oku-no-in, Tenju-an, Konchi-in, Yasui-jinja, Shimogamo Jinja, Honen-in. To improve the design of SHIRO, we made some ‚visual / sensual research‘ by visiting some local lacquerware shops in Gion, Kyoto, old book shops, temples and museums. Very impressive was the Tokugawa Art Museum in Nagoya, which hosts the original script of Tale of Genji by Lady Murasaki, the probably first novel of the world. The current exhibition was called ‘The life and culture of the samurai lords’ and therefore included items and artworks suitable to inspire narrations for SHIRO, e. g. arms and armor, tea ceremony utensils, paintings and household tools. is a temple near Lake Biwa. Lady Murasaki began to write the Tale of Genji here in the year 1004. We visited the temple because Tale of Genji is a potential theme for an upcoming new puzzle type within SHIRO. The one-legged torii at Sannō Shrine in Nagasaki is proof of the destructive power of the atomic bomb that hit Nagasaki in 1945. As a simple, but loud and clear speaking image it might be suitable for a representation of Japans World War II past within our game. We also visited the Nagasaki Atomic Bomb Museum, the Peace Park with the Hypocenter Park and the National Peace Memorial Hall. Not much covered, however, were the war crimes caused by Japanese soldiers during that time. We’re still not sure how and if to deal with World War II within SHIRO. Shintoism played the role of a nationalist religion, but connecting that part of history with a game that is fun to play could also turn out problematic. For 200 years, the artificial island Dejima, then near the port of Nagasaki, now within the urban port area, was the only point of contact between western and Japanese people. The Dutch were, after the Portuguese and their missionary attempts were banned from Japan, the only people outside of Japan who had trade contracts with Japan. Today, the reconstructed Dejima is a museum. How different cultures benefitted from trade and therefore the exchange of not only goods, but also technological achievements, medical knowledge, philosophical doctrines and more was interesting to learn about. 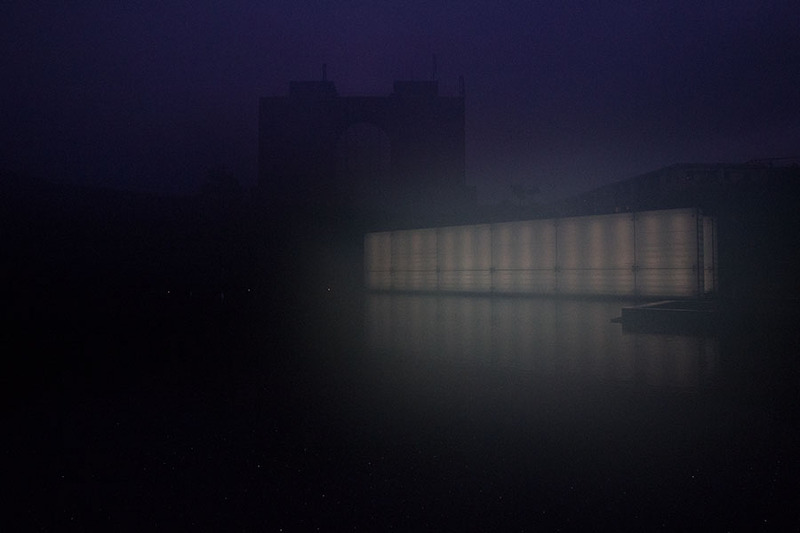 The memorial hall at night. Some other places we visited were: International Design Centre Nagoya, Sakae in Nagoya, Yokohama (also a former trading town), Osaka Castle and America Mura in Osaka, Gion, Pontocho and Higashiyama in Kyoto. For the sound of SHIRO we recorded original sounds in Japan and modified them. In Japan, natural sounds can often be heard in urban situations, such as traffic lights that make sounds like birds. To record as many intersting sounds as possible we ran around like crazy, knocking on bamboo, rinsing water, playing with stones. Over all, we had a fascinating time in Japan. 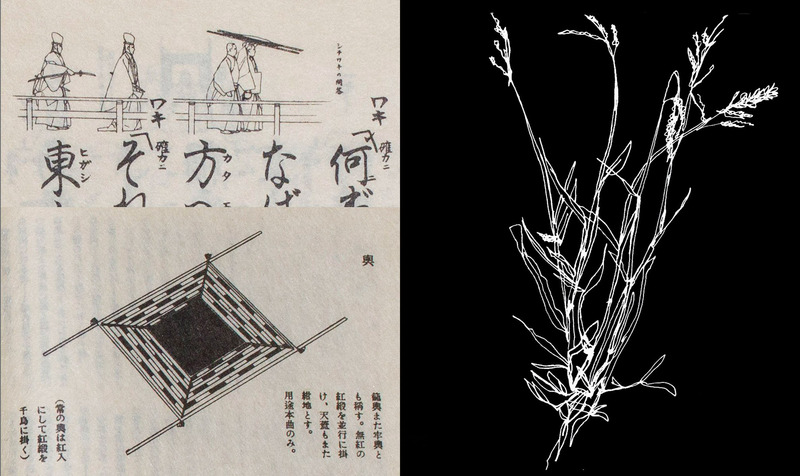 Not only could we be part of BitSummit, but also see, feel, be in Kyoto, and answer many open questions regarding the research-based narrations of SHIRO. Since our return, we improved the understandability of SHIROs game mechanics, wrote stories for SHIROs narrative parts that are related to what we’ve experienced during our journey, and developed the orange world a lot further. Still, there is much to do and in the next month, we’ll develop more puzzles, optimize the existing ones, improve and translate the narratives of SHIRO and work on a trailer. We’ll try to keep you up to date on our Blog and Twitter.